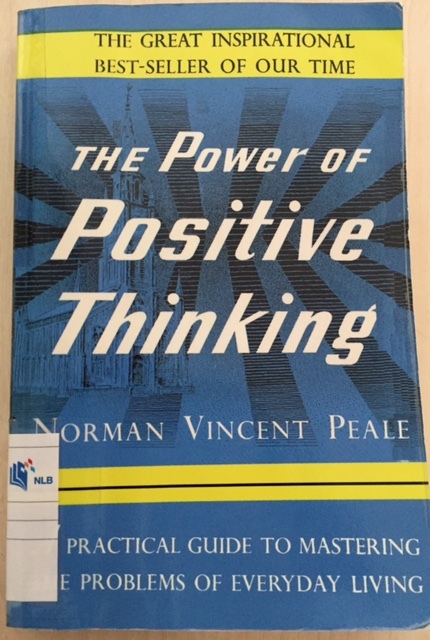 Normal Vincent Peale, 2011 Edition, First Published in 1952. 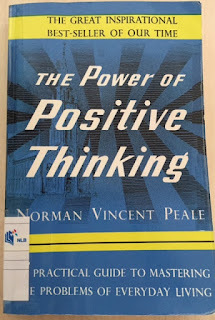 Some time ago, I was browsing through a blog and read that the blogger labeled this book “The Power of Positive Thinking” as the trigger of his/her destiny turning point for the good. Fancy by this fact, I borrowed this “positive” book from the NLB and finished reading it last month. I struggled to put up a post early as I was making very comprehensive notes. It was kind of necessary as I infused the “positive thoughts” into my mind. To sink this mental therapy deeper, I will practise positive thinking myself, while also relating interesting examples to my wife or friends. 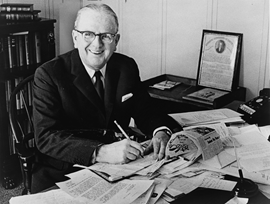 Norman Vincent Peale (1898 – 1993) was a minister and author and a progenitor of "positive thinking". Peale, born in U.S. was raised as a Methodist and ordained as a minister in 1922. Peale spent 52-year as a pastor in church which oversee membership growth from 600 to >5,000. Peale was New York City's most famous preachers. Since Peale is a Pastor, the contents from the book are associated to Bible teachings with many paragraphs advocating “faith in lord” as the ultimate solution. Disclaimer: I am not a Christian and by no means am I trying to proselytize the religion. For this review, I will minimize or remove the religious aspects of this book to minimize any potential religious conflict. Overcome inferior complex and lack of confidence using auto-suggestion and faith. Overflow our mind with faith and courage instead of thinking fear thoughts of defeat and ineffectiveness. Peale recalled that he encountered a man that lost his business, lost all his money and was in total despair crying that he has “lost everything in his life!” But he still have reasonably good health; wife still lovingly at his side; children are grown up working and all still filial; friends and most important of all, his integrity is still intact. Adopt change of pattern of thoughts to be healthier and happier. For instance if you are on a cruise, walks to the stern of the ship and imagines throwing all your worries into the ocean and watch them disappear. However our mind cannot be in state of vacuum. Hence we must always fill them up with peaceful thoughts scenery, beach, birds chirping, mountains, rivers etc. Every day at least for 25 mins, go alone into the quietest place you can find. Do talk to anyone, do not write and do not read. Relax and conceive your mind as quiescent and inactive, enjoying the silence. For me, I am lucky to stay nearby a park where there are nature reserves. I will go to the quietest place and enjoy the sight of the hill, trees and pond, breathing in the “tasty air! Do you rush to work, rush for the bus, train, rushes to meeting, rush home, rush for your dinner, even rush when going toilet or having a shower etc? Think about it, do you actually have to rush? If your mind tells you that you are tired and not interested or bored, you will be tired. If you mind is intensely interested, you can keep on at an activity indefinitely. Get interested, get absolutely enthralled in something. Throw yourself wholeheartedly into it. Get out of yourself and your comfort zone. Learn to relax and do not be too hard on yourself. Re-charged at different levels regularly. For me, exercising is my best forms of re-charging on a regular basis. A well respected prominent man in the community regarded as morally strict and upright, but became involved with a married woman. He wanted to break off this relationship but his partner threatened him with possibility that she will blow it up for him to be in disgrace! The man could not sleep well each night, energy slumped and have no vitality to perform his job. He then seeks medical help to sleep. Peale asked him how he can expect to sleep with two bedfellows! – Sleep? with “Fear” on one side and “Guilt” on the other side. Solution – Break off with the woman decisively, admit your wrongdoings and repent. In Singapore, there are many similar examples - Acclaimed Singapore film Director Jack Neo extramarital affairs, ex-speaker of Parliament Michael Palmer, former MP of Hougang, WP’s Yaw Shin Leong etc. Stay tune to Part 2. Yes, yes yes...the blogger I mentioned in the article is u. Now I am full of positivity all thanks to you. Never try the Power of Positive Thinking in the stock market! Test it out with your wallet! Haha...this is so true! I should put a big disclaimer reference to Stock market or our wallet. I does not work in the finance sector but in oil and gas. 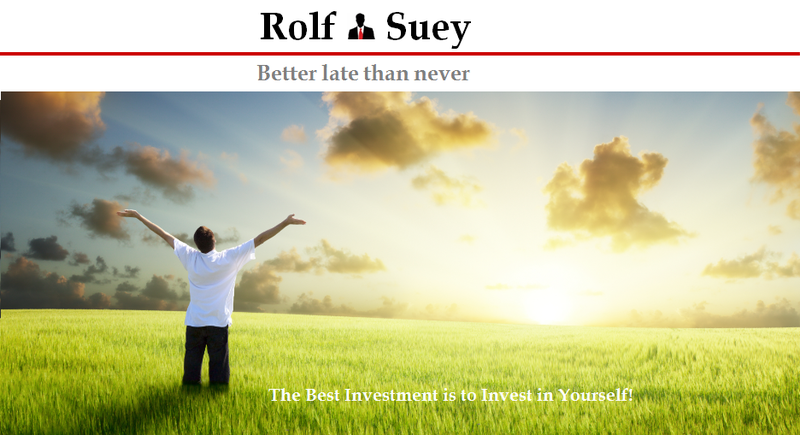 You can check out “about me” here to know more about me.